Immediately after his meeting with President Castro, Obama held a press conference with the following additional remarks about Cuba. “So I am cautiously optimistic that over the coming months and coming years that the process that we’ve initiated, first announced in December, reaffirmed here at the Summit of the Americas, will lead to a different future for the Cuban people and a different relationship between the United States and Cuba. 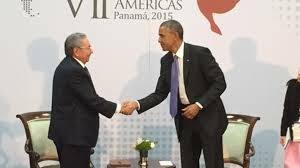 In addition to the hyperlinked text of these remarks, this post is based upon the following: Lederman & Kuhnhenn, In historic face to face, Obama and Castro vow to turn the page, Wash. Post (April 11, 2015), DeYoung & Miroff, Obama and Castro hold historic meeting, agree to foster a ‘new relationship,’ Wash. Post (April 11, 2015). Future posts will cover other aspects of the Summit of the Americas. Prior posts set forth substantial extracts of Obama’s and Castro’s major speeches at the Summit. As discussed in a prior post, President Obama on April 14th rescinded the designation of Cuba as a State Sponsor of Terrorism, to be effective in 45 days.